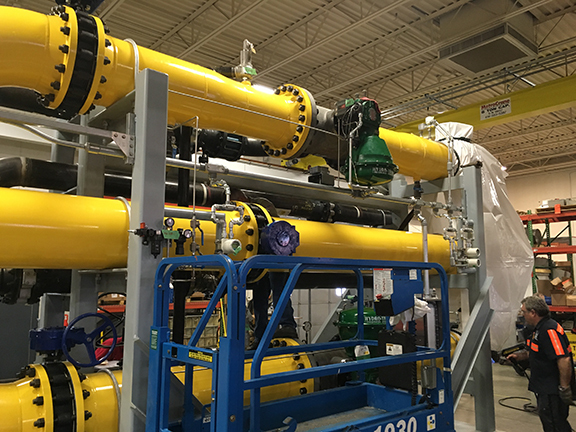 Custom Direct Steam Injection Skid Systems - Hydro-Thermal Corp.
Turnkey systems incorporating direct steam injection Hydroheaters are furnished with skid-mounted piping assembly, training and start-up services. We integrate the piping assembly with a customized, PLC-based, fully automated control panel as customized to your process. Your operators can continuously monitor the process at all points throughout the system without leaving the control room. ATTEC® designs are readily interfaced with distributed control systems and available with technical assistance and support. Integrated customized, PLC-based, fully automated control panel monitors your process at all key points. At the heart of every ATTEC system is a direct steam injection Hydroheater®. The Hydroheater transfers heat by injecting steam at high velocity into your liquid or slurry. This high velocity steam disperses the liquid or slurry into tiny droplets, creating large surface areas necessary for optimal heat transfer. The rapid heat transfer that occurs in the Hydroheater® causes the steam to condense and be dispersed into the liquid very quickly, eliminating the hammer and vibration associated with less sophisticated heaters. To avoid special parts and reduce maintenance time and effort, we integrate and install the support components you specify and mount them to a sanitary skid. Whether designed with a stand-alone control system or to be integrated with your plant process, ATTEC® systems are completely customized to your process needs. Each system will be shipped only after we have personally tested the pressure and controls in our in-house lab testing facilities, and our field service technicians are available to help with start-up support to assure your smart investment in an ATTEC system. They will also provide you with thorough documentation for your plant records. Designed to optimize the Hydroheater's performance, every ATTEC system is engineered, built, and installed to the individual specifications of your process. This includes process requirements & type, flows, and certifications (3A, ASME, CE/PED, CRN). Many direct steam injection heaters incorporate a sparger in their design, making CIP difficult. Our simple stream-lined design makes it easy to clean in place. Many externally modulated direct steam injection heaters cause hammering, scaling, and plugging. Internally modulated Hydroheaters ensure constant steam pressure and velocity, producing a uniformly heated product without process issues. ATTEC Skids are made for your specific operating conditions. We need to know a little bit about your process and plant set-up in order to design a skid that will work best for your conditions. Please fill out this form or contact us here.